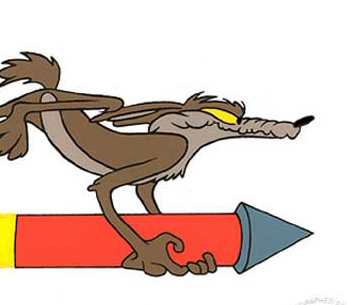 Wile E. Coyote is a super smart coyote that is locked in a never ending chase after the Road Runner, a super fast road runner. 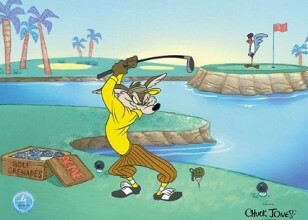 For obvious reasons, Wile E. Coyote rarely chases after the Road Runner on foot. Instead he prefers to use a variey of schemes and tools to catch his prey. Operating exclusively on devices and products that he's purchased from the ACME corporation, Wile E Coyote engages in overly elaborate plans that always backfire on him for a variety of comical reasons. 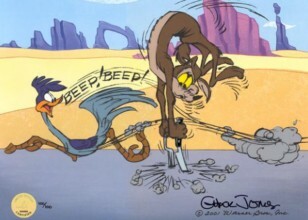 More often than not, the plan fails due to his own incompetence or defective products rather than the interference of the Road Runner. 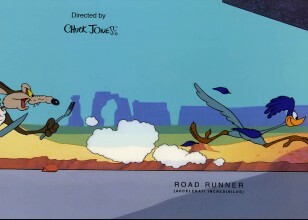 One of the most classic gags involves the Coyote painting a landscape or the entrance of a tunnel on a solid wall and then waiting for the Road Runner to smash into it. 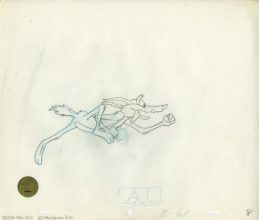 However, the Road Runner somehow defies all laws of physics and runs off into said landscape or tunnel, leaving Wile E. Coyote completely perplexed. Deciding to chase after the bird, he either smashs straight into the wall himself or is run over by a train that exits the "tunnel" that he made.